If one or more of my players decide to go on a shopping spree, I've previously had problems describing the shop's inventory, without going into much detail or making it seem like the shop has only 2 items. Of course, I can describe the atmosphere and the general nature of the inventory (e.g. "herbs" or "jewelry"), and that's just fine if the players walk into the shop looking for something specific, such as an herb that stops bleeding or a silver necklace with a sapphire embedded into it. However, I'm unsure how to handle players that recently noticed "Hey, I've got 500 gold floating around that I want to spend on useless stuff". Or, in other words, players that want to look around for random shops with a random inventory to see if they find something of interest. In the real world, this works, because you can literally walk into a random shop and look around to see if there's anything interesting. In D&D, the DM has to come up with something, and it's boring and frustrating for the players if it's always the same things. So, what can I do to make random shopping interesting for the players, without for example preparing huge inventory lists in advance? Or, because we live in the Distant Future, random generators (which are really just fancy tables). Having pre-generated tables allows you to easily generate interesting items, boring items, and everything in-between, as needed, mid-adventure. Generate 1 to 3 hoards (via any of a number of freely available online generators). Discard coins. Use as inventory. This worked well for pawn shops and the like in 3.5 but not in 5e because magic items are supposed to not be for sale. Use donjon's trinket generator to generate interesting items that stand out against a background of self-generated miscellany. Use chaotic shiny's merchant generator to generate shops, use gm discretion and system knowledge to fill in details as needed. Put the table generation on the players instead. For example, they can buy whatever they want off the equipment table from the PHB, but must roll v.s. the item's price for each item to see if it is available in that shop. If they roll to buy something, you record it and that thing is always available or never available there from now on, if it comes up again. I've also used non-table methods to some success, but that's a bit off-topic in an answer about tables. Of the above table-based solutions, incorporating either sort of random generator worked well. Individual items are better if you want to spend more time focusing on the actual shopping around and digging through available items part, the merchant generator is better if you are focusing on interacting with stores as a whole. Having players generate whether or not things were available was successful in signaling that shopping was not something I was interested in running, but did shut down the players desiring to focus the campaign on shopping. What is this browsing you speak of? Note in the real medieval period you could not browse a shop. You were not even allowed in the shop most of the time: too much risk of theft. There was a window with a counter and you told the shop owner what you wanted and they brought it to you. That did not change until very recently. That is why smaller shops had half doors (Dutch doors): you would open the top but leave the bottom shut, thus doing business but not letting people inside. 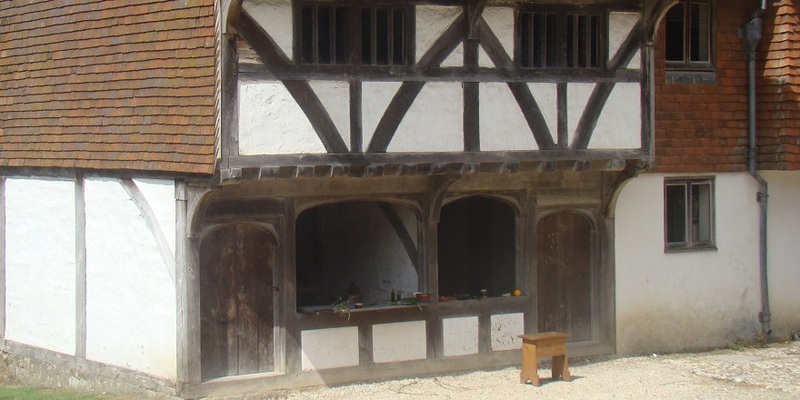 Larger shops had a purpose built window with a shutter. Many people lived in their shops as well, so there is even less reason they wanted to let you in the shop. You characters will not be allowed in a shop without a good reasons, such as a cobbler's or tailor's that needs to take measurements. This depends on what level of realism you want, but it can also help player to get into the mindset of a setting where the craftspeople are the people selling their goods. A shop only selling one thing is fine. "What does this shops sell?" "Candles." The shopkeeper points to a carved candle over the door. "I have big candles, small candles, tall candles, even scented candles that smell like flowers. It's a candleshop. I'm a chandler, if you want boots go see a cobbler." Smaller towns might not even have many types of merchants, relying instead on traveling merchants for many goods. All you really need is a list of shops and maybe a brief description of what they sell (not everyone will know what a cobbler is). This list would be roughly the same for any city that size, although you can create some unique shopkeepers to add flavor or cross out a random shop ("Eaten by wolves, very sad"). You could literally just hand this list to a player — that will let them scan it for ideas instead of you basically reading the same list. Then they can decide which shop they actually want to go to. If you want to narrate this, most shops had a carved sign to identify what they sell, and the list could represent the characters scanning all the signs as they walk along, which they can do while walking and talking or even while just doing other things around town. You can give almost every single item on the equipment list its own shop in a large city. The rich actually hired stewards to handle all the day-to-day shopping for them. For this reason (among others), the stewards' job was to know where every merchant was and buy things when needed. If you want a master list for the players, there is an old book, Gary Gygax's World Builder, which is nothing but list and lists of mundane objects. Lord Eadric's master equipment list is good as well, even if it is for an older edition. At best there might be a seasonal or permanent marketplace with stalls; each seller would not have much variety though, but at least they would be mostly in the same place. That's where you pull out the "lots of foodstuffs, some animals skins, a few animals, but one stall catches your eye..." general narration. Chaotic shiny actually has a nice generator for bazaars/markets you can use to bulk out your list quickly. I myself have a random mundane useful item list I made just for random stuff players might find in defeated NPC's pockets — things like a collapsable leather bucket, a jar of grease, or a stuffed mouse. Any time the players think of something we add it to the list; it helps make the fallen feel real but could just as easily be used to flavor up a market or bazaar. The one exception to the one shop per item was pawn shops, which had such diverse merchandise they had to let people see it, but even then it was separated by a counter. You could easily create a spreadsheet or chart for pawnshops. The various magical shop inventories you find might be a good example of what a pawn shop might look like, where most of the merchandise is unique. Donjon's shop generator is good for this one. This is balancing narration and information — there is such a thing as too much narration. Do I take several minutes to try to describe the location of every character every time anyone moves, or do I use a map grid? Do I describe the puzzle in minute detail or do I hand the players a sketch of it? If the player wants a list of everything, then give them a list. A simple physical list is far faster for browsing than taking several hours to narrate every shop in a city, and better reflects how browsing happens. Don't describe everything; improvise one or two items of potential interest. Don't read a complete list of the inventory to your players - instead, describe them letting their eyes wander about, and then spotting a specific item of interest. This item might be something that you come up with on the spot because you had an idea for something that might be of interest for the player(s). For example, if your players' characters recently killed a dragon, they might find a book titled "Draconic anatomy issue #1: skin, teeth and claws". Or, if one of them recently fell in love with a noblewoman, they might find a particularly fascinating piece of jewelry. It might also be something from the general equipment table if it's something the players could use in the near future, such as a shovel, if you plan for them to stumble upon a hidden ruin with a buried entrance. Otherwise, you can roll on the trinket table in the PHB to generate a random token with no particular use that can be bought as a souvenir of sorts. Examples for trinkets:  A dead sprite inside a clear glass bottle, or  A fan that, when unfolded, shows a sleeping cat, or  An ornate brooch of dwarven design. If your players still want the inventory read aloud to them, hoping that something catches their ear, it's an OOC issue. Now, if your player(s) insist that they want to take a look at everything, hoping that you mention something that "catches their ear", then simply describe their characters browsing the shop, but that they find nothing else interesting, just general items fitting the shop's theme. If a player is not content with that either, it's an OOC-problem. You could tell your player that there's nothing of interest for his character in this shop, as long as you as the DM don't know what he's looking for because you can't read his mind to find out what interests him (or her). In any case, at this point it's not your fault anymore, because you simply can't read your player's minds. I am known among my players for an unwillingness to engage in small details related to shopping, especially the infamous haggling scenario. This is closely related enough that I also (effectively, if not in these words exactly) refuse to perform the task as GM. The question is how to do this gracefully. I typically shift the burden back on the players by asking what it is they're looking for-- start with the big categories (Clothes? Jewels?) and get them to fill in as many details as they can and narrow it down (troll-claw back scratchers? Stitched dragon-scale designs on their trouser bottoms?) The first part of this process, at least, can probably be posed as, "What part of the city are you headed for? The tailors district? The tanners? Something else?" If you and they are both good at this process, you can probably riff off of each other for at least a few minutes. If you and they are really good at this, you can probably get them to add some meaningful local color to wherever they are. If they can't do this, that probably means (probably) that they have no good idea what they want, and are (not necessarily in a mean-spirited way) trying to get you to do the heavy lifting and do a lot of narrative work that ends up going nowhere and has little significance. I don't think that's all on you. If they can't meet you half way, I would feel free to move it along smartly and not feel guilty. Actually, Chapter 5 of the PHB is a pre-created huge inventory list. It also has the advantage of any player with a PHB has the list. You can just tell them to look at Chapter 5 if they want to know what's available in this particular town. So that takes care of the inventory-list part. Assuming the PCs are in a fairly big town, you can tell them, yes, there's most kinds of mundane shops in this town. Anything that's in the PHB, Chapter 5 is available. There are clothing shops, weapons shops, whatever you want. You can pre-plan specific shops if you want, and decide on the NPCs that run it, or make up a name on the spot. But maybe the shopping part isn't the interesting part. Maybe you and your players really enjoy fantasy shopping, and in that case, go for it. Or maybe they are searching for a story hook and they just don't know it. In that case, it's not the shopping that's interesting, it's what happens while they're shopping. Anything can happen. Maybe the local crime boss wants a word with them. Maybe the mayor does. Maybe they find a lost child or a note on the ground or a mysterious lamp in an alley or they catch someone trying to pick their pocket or they feel like they're being followed or they're trying on an outfit in a clothing store and the mirror talks to them or they find a magic ring or an oracular pig or a hidden doorway or . . . you get the idea. Maybe shopping isn't relevant to your story. If that's the case, you can just dispense with it. You can tell your players something like, "Do all the shopping you want between sessions while you're in town. You can buy anything listed in the PHB Chapter 5, Equipment. Just buy whatever you want and subtract your gold." You could add some limits depending on your particular campaign. For instance, if they are in an inland temperate zone you can tell them anything in Chapter 5 except camels and elephants, and the only water vehicles available are keelboats and rowboats. On the other hand, if they're in a desert coastal town, maybe camels and elephants and warships are all available for sale. It includes lists of items you'd expect in different types of stores, such as potion shops, adventuring supplies, general store, faith stores, etc. Right up your alley! It has been active for a few years. If you already know that your players like to go shopping, prepare for that in advance. First of, don't include supermarkets. These didn't exist until quite recently. It would be better to design your shopping areas like a traditional village market place. You have between one and three market stands, each selling only a very limited amount of things. Such market stands would not carry anything extraordinary but rather items that everyone would need. If you want special items, you need a special craftsman for that. So for example, a regular market stand would not sell armor, weapons, clothing or shoes. For these items the players have to go to a blacksmith, tailor or cobbler. This means, if the players encounter a shop, you don't need to give them a huge selection of items, because the shop only has a very limited range of goods. Items like clothing, armor, weapons, shoes or similar would not be made in advance. Stocking multiple sizes and styles of items (as is done in a clothing or shoe store nowadays) is also a relatively new invention. If you buy items from a craftsman, they are usually only made after they are ordered (and possibly even paid), since they need to be fitted to the buyer. Again, here you don't have to prepare that much, since the players have to order what they want. So the players choose what they'd like to have and you, as a GM have to determine whether the craftsman can make that, how much it would cost and how long it would take. As a rather rare occasion the players could meet a (traveling) merchant who would have special items. This works well for trinkets, potions and other little things. The trader either has items that players can buy right now, or maybe he knows where to get stuff the players request. Here, you also don't have to prepare that much. The merchant would not have that many items on himself. He would also probably not let the players just browse his stock, but would rather tell the players what the highlights of his items are. I ran into that problem on one occasion where the players came across a town with a market place, that I put there mainly as decoration, but the players stopped and wanted to go shopping. I didn't have any stock prepared for the market stands, so I said it was a cheese fair and all the merchants would sell was different kinds of cheese. They actually explored every last one of the stands and during the time they spent looking through all the cheese I actually figured out something cool that one of the last stand owners randomly had, that he would sell to the players. This scene is actually one of the running gags that they still bring up years later. Not the answer you're looking for? Browse other questions tagged dnd-5e gm-techniques improvisation or ask your own question. How can I quickly come up with random encounters and puzzles? How do I keep a party together without railroading? Can the versatility of Feign Death be increased by combining it with Lesser Restoration and/or Freedom of Movement?